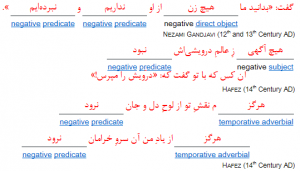 Predicate is the central sentence constituent and represents the process or the state which is covered by the sentence. 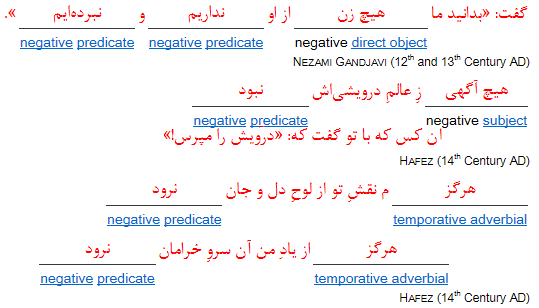 In Persian, only verb phrases can act as predicates. This form indicates that the speaker is certain that the addressees attend his orders. Infinitives can be used in Indo-European languages as predicates, if the statement does not refer to a certain subject. In this case, such verb phrases have neither a number nor a person, and also no mood can be assigned to them. Such a predicate is called infinitus. In Old Persian, the infinitive with the benefactive suffix /-æij/ played the role of infinitus. It appears in some positions in Behistun inscription: /nipæiʃtænæij/, /kætænæij/ (/kæntænæij/), /kærtænæij/, /dehistænæij/. 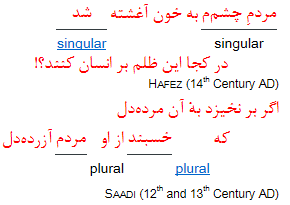 Because of this grammaticalization, the two constituents are not separable in Persian. Such a perfect participle is in the same predicative subcategories as the predicate of the second conjunct. Hafez (14th Century AD), see 15•۴•l.